The past few years have seen a monumental shift in the way we do business in Ireland – in particular when it comes to computing. The era of cloud-computing is here, and with it the ability to have enterprise-level functionality at a fraction of what it cost only a few years ago. For businesses, it’s the biggest single evolution since the internet itself. The uptake of cloud technology has jumped rapidly in Ireland in recent years, with 20% of SMEs now using cloud technology and only 17% remaining unaware of what cloud technology actually is – down from 25% in 2013. This is in part thanks to improved broadband infrastructure across the country, with as a strong internet provision a necessary foundation for cloud-technology adoption. What’s Upload Speed got to do with Cloud? The Internet is a two-way street, and businesses are sending more data “up” than ever before. 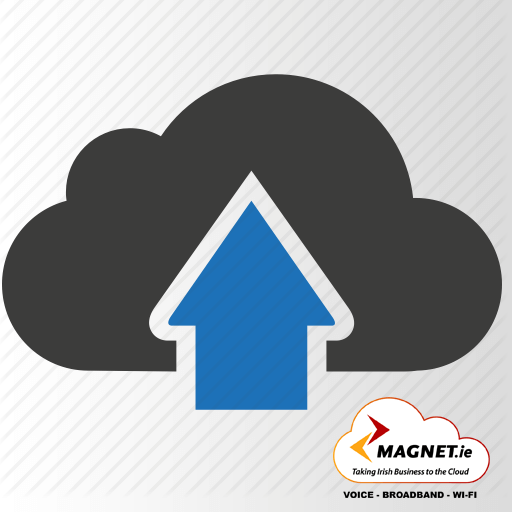 Cloud services rely on strong speeds – both up and down – to function correctly. Why then, are upload speeds talked about so infrequently? With most ISPs only touting download speeds, one would be forgiven for assuming that upload speeds aren’t really that important, this couldn’t be further from the truth. It’s true, of course, that consumers have traditionally looked solely at download speeds as the most important factor when judging internet packages. Indeed, downstream rates determine the speed at which you can access data, browse the web, download files and stream video – all important factors for businesses. However, in the age of cloud-based technology, the often overshadowed upload speed has become critical to business operations, and is fast becoming the determining factor for businesses when choosing their ISP and fibre packages. Why has Upload Speed become so Important? Put simply, your upload is your “sending” speed; the speed at which your important data can reach its destination. With many businesses dealing with growing amounts of data; switching to VoIP phone systems and sharing content online, sluggish upload speed can quickly bring productivity to a grinding halt. The software and applications we use are moving to the cloud too: even everyday things like word processing (google docs) are becoming increasingly cloud based – a trend that will only continue. A connection with high upload speeds is essential for virtual communication with colleagues – particularly in multi-site businesses or companies with a mobile workforce who depend on remote communication and video conferencing. Skype recommends upload speeds of 1.5Mbps per user for HD video calling – you can see how this can quickly add up to a whole lot of bandwidth. Perhaps even more significantly, a strong upload speed is vital for the smooth running of VoIP phone systems. VoIP services offer a plethora of advantages over traditional phone systems – but they rely on fast and reliable upload speeds to keep everything running smoothly. This is particularly true for companies making large numbers of calls simultaneously. File sizes are increasing and the amount of data companies need to store larger than ever, it’s a smart move for companies to ditch external hard drives and costly server in favour of adopt the cloud for offsite backup. Particularly for businesses that work with large video or design files, and those that deal with sensitive information that requires backup, the cloud is becoming a necessity. Having a strong upload speed can allow businesses to backup their data in a matter of minutes, increasing efficiency and reducing the risk of interruptions that can stall productivity. Sending large files need not be as expensive and difficult as it once was. Many people use cloud computing to exchange files and documents on a day-to-day basis. Cloud technology has made the once tedious task of sharing large files simpler than ever, with the use of services such a DropBox and OneDrive becoming increasingly integrated in the modern workplace environment. Of course, the convenience of these services are facilitated by your company’s broadband provision. Fast upload speeds can allow businesses to exchange files with partners, colleagues and vendors in a matter of seconds. People and businesses are producing and sharing more content than ever before. It’s no longer just those in creative industries that are uploading bandwidth-intensive media to the internet; whether it be online tutorials, video content for social media or live streaming events, modern businesses realise the power of utilizing social and video content to get their brand and products out there. Strong upload speed will ensure that this content can be shared smoothly and efficiently, ensuring your message gets to the right people at the right time. The speed at which you can get information into the online world really matter – and it’s importance is growing. Of course, these are just a few of the benefits of fast upload speeds. So, why do ISPs avoid talking about Upload Speeds? Other providers don’t talk about upload speed because other providers can’t compete with Magnet’s upload speed. Our Business Fibre 350 product offers upload speeds of up to 80Mb: this is unparalleled in the Irish market. What’s more, it’s available all over Ireland to over 1.3 million properties! So even companies in more rural areas can feel confident in moving to the cloud. Upload speed is a key metric in productivity for businesses in the era of cloud-technology. Read more about Business Fibre 350 here.